I live in San Francisco, California, with my wife. We like to write, we like to travel, and I'm researching my family history. We're jumping into the blogosphere to share our interests with other like-minded souls. College City residence of William John and Catherine (Foster) Clarke, built in 1879. My ancestors certainly experienced the death of loved ones far more frequently than we do today. Life expectancy was much lower in the 1800s. Diseases that were common in California’s Central Valley included malaria, typhoid and tuberculosis. Life on a ranch provided plenty of opportunities for accidents and injuries, and medical care was not always readily available. In my post of October 1, 2015, I listed the seven children of William John Clarke and Catherine (Foster) Tenney Clarke. Although all of the Clarke children survived infancy, three eventually preceded their parents in death. The last child to be born was the first to die, and is therefore the one about whom the least is known. He didn’t have enough time on this earth to create much of a record. He was born May 10, 1879 and died of typhoid on February 16, 1887, three months shy of his eighth birthday. In December of 1890 Willie and a young neighbor were returning from hunting when Willie’s loaded rifle fell through the slats of the wagon and discharged, hitting Willie who bled to death. Upon hearing the news of his death, Willie’s wife Annie gave premature birth to twins who died shortly thereafter and were buried under the rose arbor at William and Catherine Clarke’s College City home, compounding the tragedy of young Willie’s death. The third child to die was Celia, the second-to-youngest. She was born April 18, 1876, and died January 12, 1894, three months prior to her 18th birthday. She had been ill with consumption (tuberculosis) for a couple of years prior to her death, and died of that disease. It is said that it was despondency over the deaths of his children, particularly Willie and Celia, that drove William John Clarke to commit suicide. On October 28, 1894, he shot himself on his son Willie’s grave in the College City cemetery. He was 74 years old. I can’t help but wonder if there weren’t other factors weighing on Clarke. Many of his lands were mortgaged at the time of his death, and when everything was sold and debts were paid there was very little left. The History of Colusa County by Will S. Green, published in 1880, states that Clarke owned, besides his residence in College City, a farm of 640 acres in Colusa County, 2,063 acres of land in Yolo County, and a dairy ranch of 1,000 acres in Plumas County where the family spent their summers. There must have been some downturn of fortune in the fourteen years between the publication of that volume and Clarke’s death. In any case, it was a sad end to a man who contributed much to the county of Colusa in its early days. Recently an issue which has been occasionally popping up in my newspaper as well as my family research was on the front page of the Press Democrat (Santa Rosa, CA): The resurgence of the Grange. The very word grange brings up good memories from my childhood. 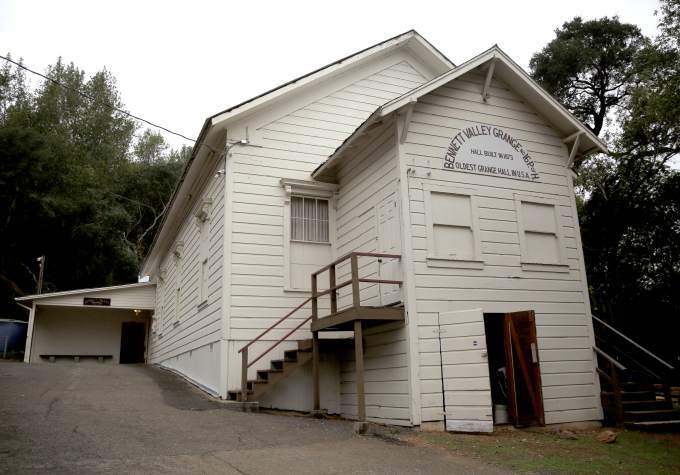 As a kid I remember occasionally attending social events held in grange halls in Sonoma County, the nearest of which was the Bennett Valley Grange. Dances were held there regularly as well as other social events and meetings. This morning I read that Bennett Valley is the oldest continuously operating grange hall in the entire nation, founded in 1873. The topic of the Grangers, or the Patrons of Husbandry, has also come up in the family research I’ve been doing. A letter written in 1874 by Sarah (Little) Love, an Irish immigrant to and resident of Illinois, and half-sister to my great grandmother, Catherine (Foster) Clarke, mentions the growing Grange movement. Both Catherine and Sarah were married to farmers, and their letters frequently addressed topics that were important to their farming families. As for the Granger’s [sic] they are doing very well and I think in a year every farmer will join them, if they know what is for their good. Eddie [Sarah’s son] went last Monday to one of three meetings and said they had a very good and large gathering. I think we shall join them. This little snippet about the Grangers caught my attention and piqued my interest about the organization. I found several good sources of information. My favorite was a book written in 1874 by Ezra Slocum entitled The Patrons of Husbandry on the Pacific Coast. It is a rather amazing history of farming in general as well as a detailed history of the Grange in California. Slocum was a professor of agriculture at UC Davis and was involved in many of the early meetings. Another book that has shed much light on the plight of the farmers is Rulers & Rebels, a People’s History of Early California, 1769-1901 by Laurence H. Shoup, a professor at UC Berkeley. Published in 2010, it is a Howard Zinn-styled history of the state in terms of capitalism vs. labor, class and race. Shoup describes the absolute monopoly the railroad barons had on transportation. By the late 1860s the owners of the Central Railroad—Leland Stanford, Collis P. Huntington, Charles Crocker and Mark Hopkins—were creating a vast monopoly which included owning or controlling the docks in San Francisco, the granaries where the farmers’ wheat crop was stored until it was shipped, the steam ships, and of course, the railroads. By the early 1870s the farmers could not turn a profit on their wheat crops (the primary crop grown in California at the time) due to the extortionate storage and shipping fees. Even the price of the sacks required to ship the wheat was controlled by this monopoly, and you might imagine that the prices were not set to benefit the farmers. This scenario was being played out all over the nation. The Patrons of Husbandry, which had begun in England, got started in the U.S. in 1867, and was in essence farmers organizing against policies that were ruining them. By the mid-1870s, the California Grange had succeeded in building their own storage silos, formed their own bank, hired an agent to work on their behalf to ship their crops to England, and formed various cooperative arrangements that saved money on sacks and implements. They encouraged a bigger manufacturing presence in the state so that they did not have to rely on goods made out-of-state, which were, of course, transported by the railroads, driving prices up. On a state-by-state basis the Grangers were eventually able to increase regulation of the railroads, but it was not until the Interstate Commerce Act of 1887 that federal regulations were passed. All in all, the Grangers had a very positive effect on the economics of farming. The Grange movement also had the goal of reducing the isolation of farming families by hosting social events and assisting farmers in keeping abreast of new techniques by hosting workshops and maintaining agricultural libraries. The Grangers were involved in getting Rural Mail Delivery put into place on a national scale so that farmers could receive mail at their homes rather than having to go in to town or pay private delivery companies. Women held equal places with the men in the Grange halls and were able to hold office, present policy papers, and take part in every aspect of the organization. Thus the Grange became the heart of many farming communities. Lately I’ve been reading that the Grange has had a recent resurgence in Sonoma County. The Sebastopol Grange is one of many that has become very active with a new generation of young farmers. A visit to their website reveals that “The Grange isn’t just for farmers! Come to the Grange if you’re a supporter of local food and sustainability or a farmer or an eater…” In addition to the Farmer’s Guild meetings, events such as a Fermentation Workshop, and a film and discussion on permaculture were offered. I was heartened to learn that the Grange continues to hold a place in rural communities. There is trouble on the horizon, however, as it turns out that these Granges have been operating apart from the National Grange under a reorganized California State Grange. Many small farmers in California and Oregon particularly feel the National organization has become too closely intertwined with industrial farming. The National Grange has sided with Monsanto, a chemical company which produces genetically modified seeds which it sells to farmers while prohibiting seed saving, requiring farmers to buy new seed every year. The National Grange is also strongly in favor of GMOs (genetically modified organisms) while the California State Grange was a primary force in trying to get a ban of GMOs on the California ballot. The national organization has filed several lawsuits against the California State Grange resulting in the state organization severing all ties with the national in 2013. Now the National Grange is threatening to take over the assets of the local granges, including the Grange Halls, and threatening to sue the reorganized California Grange for using the word “Grange” in the name. It’s a sad state of affairs that the organization that once stood for the small, family farmer against the monopolies of huge corporations has now gone to the dark side, aligning itself with giant agribusiness and corporate farming. At the same time I’m greatly heartened by the local efforts to organize around sustainable food and land issues in northern California and other regions, and hope that they will be allowed to continue in the true spirit of the original Granger movement. The next decade or so after their marriage in 1867 finds William and Catherine Clarke—or Will and Katie, as they were known—building their family, their farming and ranching enterprises, and their community involvement in Yolo County. At the time of their marriage, Catherine’s daughter from her previous marriage, Elizabeth “Lizzie” Tenney (my great-grandmother), was four. 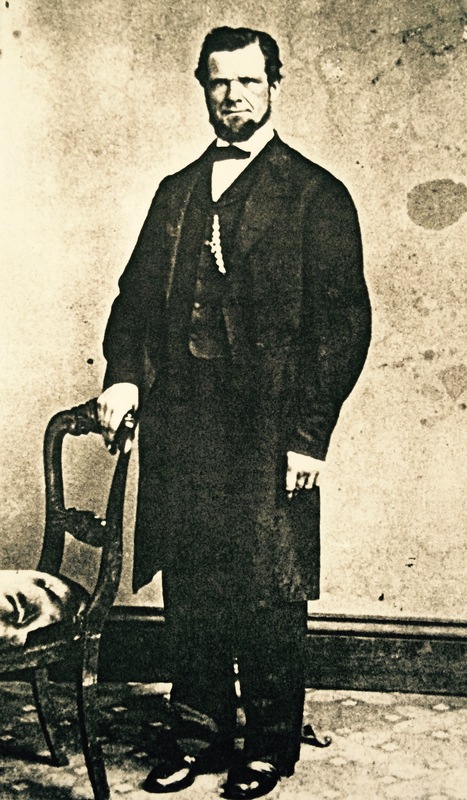 Two months after the wedding a son, William Dougal Clarke was born (recall that Lizzie as an adult wrote in a letter that she had learned that brother Willie was in fact her full brother, not her stepbrother as everyone had been led to believe, i.e. he was not the son of WJ Clarke but of Catherine’s first husband, Willard Tenney). Two years later a daughter, Margaret Jane, was born (1869). In 1871 another daughter, Catherine May, followed by a son, Noble Foster, in 1873. Two more children came along, Celia Violet in 1876 and George W. David in 1879. Twelve years after their marriage the Clarkes had seven children. Although William and Catherine Clarke have plenty of descendants living today, these descendants all came from three of their seven children: My great grandmother Lizzie bore nine children, all of whom lived into adulthood; Margaret bore three sons, two of whom lived into adulthood; and Foster Noble produced a son and two daughters, all living into adulthood. A tragic event occurred just five months prior to William’s marriage to Katie. William’s partner Jack Stewart was killed in a bar fight in the Knight’s Landing Union Hotel, stabbed to death by Charles A. Brown, who was convicted and sentenced to six years in state prison. Clarke subsequently bought out Stewart’s heirs—siblings still living in Scotland whom I’m sure had no use for wheat fields in California—for Stewart’s shares in the ranch. In 1870 the 60 acres that had been Stewart’s share were purchased by Katie (Foster) Clarke’s brother, James Washington Foster—the only one of her siblings to be born in the U.S. (Illinois) after her family emigrated from Ireland. One of the things I’ve found to be common in my own family history, and is probably common to many families in early California, is the intermarrying of families, i.e. two brothers from one family marrying sisters from another, or cousins marrying sisters, etc. This situation sometimes creates confusion, especially around names when the tendency for kids to be named after aunts, uncles and grandparents is added into the equation. 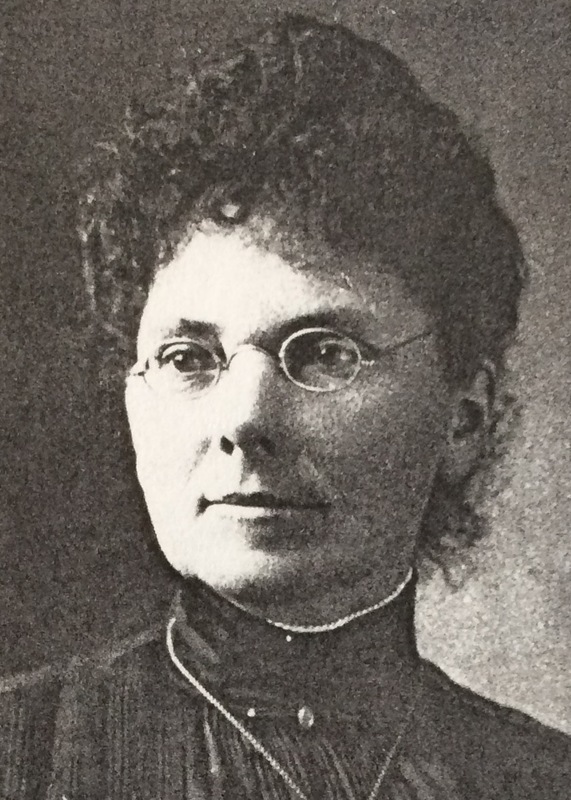 Katie Clarke’s mother was Margaret, and she had a sister also named Margaret. William Clarke also has a sister Margaret, and he and Katie named their daughter Margaret. Katie’s brother James Foster married a woman named…wait for it…Margaret. In any case, by the 1870s William had two siblings living in the Yolo/Colusa Counties area, his brother Noble and his sister Margaret. Katie Clarke also had two siblings in the area, her half-sister Elizabeth Little, who married William’s brother Noble, and her brother James Worthington Foster, a Civil War veteran who is shown to be living with Will and Katie Clarke in the 1870 census. In spite of Sarah’s misgivings about the area, it seemed to suit Will and Katie Clarke and they lived out their lives in Yolo and Colusa Counties. Too often I fear our vision of the history of the West is very narrow in focus, unmoored from what was happening in the rest of the country and the world. Our take on the “old West,” calcified from fourth grade history lessons, is limited to wagon trains, pick-axes and the Donner party. Wallace Stegner’s Angle of Repose offers a much broader view. This book, published in 1971, had somehow escaped my attention for all these years. I recently heard a claim made that it is one of the best novels ever written. I have got to read this book, I thought. I sauntered up the five blocks to our neighborhood public library and checked out a copy. I loved this book. I enjoyed every moment I spent reading it. This was certainly one of those synchronous instances of a book showing up at just the perfect time in my life. There are rich layers of storytelling here, and some wonderful writing. It would have been an engaging read at any point, but I found its overlap with my own current interests in both my family’s history and California history very compelling. History comes alive when we begin to understand what people’s lives were like during a bygone era, and Stegner’s novel paints a captivating picture of life in the developing West using fictional and non-fictional persons and events. The narrator is a disabled man, a retired professor, who is researching his grandmother and writing about her life—as am I researching and writing about my ancestors. He is living in Grass Valley, a mining town in the Sierra Nevada foothills. This is the town my cousins grew up in and where I spent time as a kid. This part of the book is set in the late 1960s, which is when my cousins and I would have been riding our bikes and roaming over the grounds of the old Empire Mine before it was made into a State Historic Park. The book references a fictional Zodiac Mine, which was apparently based on another major mine in the area, the North Star Mine. And, for the correlation trifecta, his grandparents’ history is all wrapped up in the history of the West in the 1800s, as his East-Coast-grandmother (a semi-fictional character based on Mary Hallock Foote) married a mining engineer and subsequently spent most of her life in the unsettled West. The title of the book, Angle of Repose, refers to the maximum slant of an incline without loose materials sliding down—a term used in mining, and a reference, no doubt, to the dynamics of his grandparents’ marriage. Who were those glittering people intent on raiding the continent for money or for scientific knowledge? The old West has, of course, been much romanticized over time. As I research my ancestors’ participation in the “early” history of California, it is not lost on me that this land has a history that predates white settlers by millennia, and that California’s history for the past several centuries is based on theft. Spain took the land from the indigenous people and the Mexicans, the Mexicans eventually took it back, and the white settlers, backed by the United States government and the credo of manifest destiny, took it from Mexico and whatever indigenous peoples had survived disease and enslavement by the Spanish Missions up until that point. The settlement of the West was all about the appropriation of resources. These included minerals—the main topic of Stegner’s novel—but also land, forests, quarries, and, that priceless commodity, water. Historical fiction is my favorite genre because I get to learn while being entertained. This book does not disappoint on either score, and I now have some new jumping off points for further study on the machinations involved in incorporating the West into the United States. For example, Stegner’s novel referenced the Public Land Commission, which was formed in 1851 after California became a state. The Commission existed for only five years and was mainly a way to steal land from the Mexicans, as far as I can tell, because it forced the Californios (Mexican inhabitants of California) to defend their land grants through an expensive process. Many could not afford to participate in the legal maneuvering required, and so lost their land. The Public Land Commission commissioned a report entitled the Public Domain. This is a fascinating document—available online—of over 500 pages. The title page has the following lengthy title: The Public Domain. Its history, with statistics, with references to the national domain, colonization, acquirement of territory, the survey, disposition, and several methods of sale and disposition of the public domain of the United States, with sketch of legislative history of the land states and territories, and references to the land systems of the colonies, and also that of several foreign governments. The report is a codification of public land laws and essentially covers every treaty and legislative act used to acquire and manage (i.e. settle) land in the public domain in the US, as well as descriptions of public land systems used in Canada, Brazil, Mexico and Australia. It is quite an amazing document. Wallace Stegner’s writing has whet my appetite for further delvings into the many forces that shaped the settlement of the West. The West’s history is comprised of far more than the gold rush. The events that brought so many settlers west did not occur in a vacuum but were influenced by issues of slavery, the Civil War, the Mexican-American war, and the Homestead Act of 1862, among other things. Stegner subtly weaves the politics and current events of the period of western migration into what is ultimately a well-written novel about human relationships and the intricate workings of a marriage—definitely worth the read. 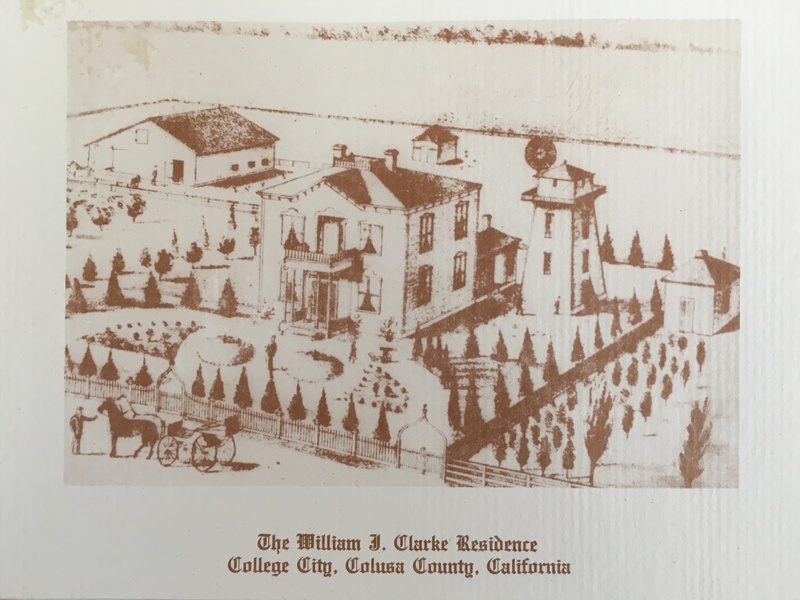 After their marriage in July of 1867, William John Clarke brought his bride, Catherine (Foster) Tenney Clarke, back to Buckeye Ranch, the ranch he owned and resided on in Yolo County near what is now the town of Dunnigan in the Central Valley about 40 miles north of Sacramento. He had purchased this 1,320 acre ranch five years prior with Jack Stewart, an immigrant from Scotland who was Clarke’s business partner in various enterprises dating back to 1850. In 1862, William John Clarke and John “Jack” Guron Stewart purchased 1,320 acres of land, all fenced, for $5,000. The owner thought that he had made a large sale as he had not made a success of it as a grain farm. The acreage, near Dunnigan, was named Buckeye Ranch. In 1863 they sowed 160 acres to Barley, plowing and sowing late, as was the custom. They met with complete failure. The first and second year it barely seeded itself, not being worth harvesting. In 1865 they harvested 30 bushels of barley to the acre and for five consecutive years, they harvested 30 bushels to the acre—all this from the plowing and seeding of 1863. Land in that section of the county was supposed to be worthless until Clarke and Stewart’s grain farming. In 1865 and ’66, they dry plowed 500 acres and sowed in the fall. The result was a crop of 45 bushels of wheat to the acre. The next year they had a volunteer crop nearly equal to the original sowing. From that time the land became valuable. A new mode of plowing and seeding had been introduced that proved precisely suited to the climate and soil. Of course, rice cannot be dry farmed—it’s a fairly water intensive crop as the rice fields must be flooded. Water is an issue which has always loomed large in the history of California and is back in the news due to the current drought now into its fourth year. Daily headlines regarding this, the second major drought I’ve lived through as a native Californian, highlight the labryinthian water rights and management systems of this state. There are many references to pre-1914 water rights, which up until now were considered to be unassailable, but that seems to be changing in the face of drought and climate change. As I continue to dig into the history of my ancestors—not just the Clarkes, but the Cains (my grandmother’s father’s family) and the Hoffmans and Boles (my grandfather’s family), who all arrived and began farming in 1800’s Yolo and Colusa Counties—I am also excited about researching water issues of the day. It’s the same curiosity—how did we get from there to here? My family’s history is closely intertwined with the early history of California. Three of my four grandparents were born in California, as well as three of my eight great-grandparents. I know of at least four ancestral family groups or individuals who came to California by wagon train, for gold or for land, or perhaps just in search of new opportunities. I find myself more and more fascinated by these pioneering families, and not just those whose blood lines I carry, but others I keep uncovering who are more distantly related by marriage. Although I fear I may have snoozed through more than one California history lesson in my school days, it all seems terribly intriguing now. I want to delve into their stories and get a picture of what their lives were like both before and after their emigrations. Perhaps that is what history buffs have in common, the desire to understand what people’s lives were like during a particular era that has passed. It’s also why we need to be aware that our own histories are also important. Believe it or not, people in the future will want to know what our lives were like. As a budding genealogist I feel fortunate that my family has been in Northern California for generations, mainly because it’s so easy to travel to the areas where they lived. Ancestry.com is a great source of information up to a point, but to get down to the nitty gritty, fill in some of the details and flesh out the stories, it’s best to visit the county where one’s ancestors lived. County courthouses, museums and archives provide a wealth of information in the form of official records—birth and death certificates, marriage licenses, divorces, property deeds, etc.—as well as photos, historical publications that can’t be found anywhere else, and the collected reminiscences of old timers. How grateful I am to the letter writers, the letter savers, the journal keepers, and the interviewers for leaving a wealth of information to sift through. Recently when my wife and I got one of our frequent urges for a little road trip, I suggested Plumas County as a destination. We had back-packed in that area a few years ago but that was before I had any awareness of the historical connections my family has there. My maternal grandparents (and great-grandparents and great-great grandparents) were primarily farmers in the northern end of the Central Valley, in Yolo, Colusa, and Sutter Counties. I’ve only recently become aware that Catherine and William Clarke, my great-grandparents, drove their cattle up to Plumas County for summer pasture every year back in the later 1800’s. My great-grandmother drove a wagon, probably filled with supplies and some assortment of their seven children—at least those too young to help with the cattle drive. They spent summers up in the mountains, as did many other Central Valley families. As roads to the area became more developed, hotels were established and tourism began to flourish in the area, families came to escape the heat of the Valley as well as illnesses such as malaria, diphtheria, and cholera. By the 1870’s entire communities were camping together each summer, coming from such Valley towns as Gridley, Chico, and Red Bluff. As I was putting together the facts and family relationships using Ancestry.com, I could not help but notice that two of William and Catherine Clarke’s offspring married into the Stover family. I could see that the Stovers were early arrivals to an area called Big Meadows in Plumas County. It was my desire to dig deeper into the story behind these marriages and the Stover family that put us on the road to Quincy recently. The Clarkes and the Stovers were both cattle ranchers, but while the Clarkes made their primary residence in Colusa County and thus retreated back to the valley come fall, the Stovers were permanent residents of Plumas County. This county sits at the far northern reach of the Sierra Nevada, while Lassen Peak, which is the southernmost peak of the Cascade Range, sits just to the north. A portion of present day Lassen Volcanic National Park is located within the northwest boundaries of Plumas County. It was and is a stunning area of forested mountains, expansive alpine meadows, and creeks which feed into the Feather River. It is the Spanish name for the river, Rio de Plumas, that gives the county its name. Many miners were attracted to this area during the California gold rush, and although the Stovers did initially come west seeking gold, they eventually settled in this area for the purpose of cattle ranching and dairying. Near Frazier Falls in the Plumas Nat’l Forest. Our trip to Plumas County was a fruitful one. I had made an appointment with Scott Lawson, the archivist at the county museum in Quincy, and by the time I arrived he had pulled out all the information he could find on the Stovers and the Clarkes. The Stover name continues to be well-known in the area, and there is a Stover Mountain, Stover Creek, and even a strip mall in the town of Chester called the Stover Creek Center. I waded through historical tomes, newspaper clippings, transcribed oral histories, and photographs—scanning them all using an app on my iPhone. Talk about striking gold! We also visited a small museum that was part of the public library in Chester, and found many more photos and information about the Stovers in particular, and life in Plumas County during the 19th and early 20th century in general. Unfortunately, the archivist was not in but I did get her phone number. I also learned that my great-grand-aunt, Catherine May (Clarke) Stover was the first librarian when the Chester library was first built in 1929, the same building that is in use today. Grave marker for my great-grand aunt, which we located in the Prattville Pioneer Cemetery near Lake Almonar. Guest register from Stover Hotel. My great-grand aunt is signed in near the bottom, on May 28. This was the last time Mt. Lassen erupted, 100 years ago. We left Plumas County well-satisfied with our visit, laden with maps, books, historical and tourist information as well as all the documents I had scanned. We only spent three days there but in addition to our family history treasure hunt we took three lovely hikes, drank some good locally-brewed beer, had several delicious meals, and met many friendly, helpful folks. A return visit is certainly in our future as there seems to be so much more to explore. I’ve gotten bogged down in telling William John Clarke’s story like a Conestoga wagon mired in the mud. I’ve got to move this thing forward because I have so many other tales to tell, including a recent family history road trip to Plumas County, California, where I learned so much more about the Clarke family’s interconnection with the Stovers, a pioneering family who ranched near what is now Chester beginning in 1859. Truth be told, the next part of Clarke’s story is a bit of a mystery to me, one (or several) I’m dying to unravel. The boy who was born two months after Catherine’s marriage to Clarke was William Dougal Clarke, or “Willie” as he was known. He was always passed off as Clarke’s son. But I have evidence to the contrary in the form of a letter written in 1897 by Lizzie Tenney Clarke to a cousin on her mother’s side back in Illinois. This letter was written one month after her mother’s (Catherine Foster Tenney Clarke) death. The tone of this letter is distressed, and Lizzie voices longing for connection with her mother’s side of the family. So, it certainly sounds like Willie—who died tragically in a hunting accident at age 23, a young married man with a pregnant wife, Anna Louisa Stover—was not Clarke’s son at all but was likely Willard Tenney’s progeny. From all accounts Clarke appeared to dote on “his” son, in any case. Catherine Foster was born in Ireland, northern Ireland specifically, and not so far from where Clarke was born and raised. Unsolved Mystery #1: Did their families have any connection back in Ireland? By 1848 Catherine had emigrated to the US with her parents and siblings, as a brother was born in Illinois that year (Catherine’s mother was also married twice, once to Edward Little and then to James Foster, and had children with each). The 1850 census finds the family living in Rock Island County, Illinois, where Clarke also lived for 10 years prior to striking out for California. Given the difference in their ages Catherine would have been a child of 7 at the time he left Illinois for California at age 29, but I wonder if their families knew each other? I suspect they must have but I can only speculate at this point. One of Catherine’s half-sisters, Elizabeth Little, married William John Clarke’s brother, Noble Clarke, but so far I don’t have the date or location, only that they eventually lived in Yolo County near William and Catherine. Unsolved Mystery #2: What, if any, was the connection between the Little/Fosters and the Clarkes in Rock Island County, Illinois? Catherine’s first marriage occurred in Illinois on September 27, 1861 to Willard Tenney, whose family can be traced back to the Yorkshire district of England from whence they traveled to New England in 1638, to escape “religious persecution”. (They were apparently much aggrieved that King Charles had ordered that “no hindrance should be thrown in the way of those who wished to dance or shoot at the butts [a target] on Sunday afternoons.” Hmm.) By the 1800’s some of the Tenneys had ended up in Illinois via New Hampshire and earlier, Rowley, Massachusetts. Records indicate that Catherine and Willard and their infant daughter Lizzie came to California via wagon train in 1864. I hope to eventually discover which route they traveled and where they first settled. The next piece of information I have is documentation of Catherine’s marriage to Clarke in 1867. What happened during those three missing years? How did Catherine Foster Tenney and Clarke meet? Inquiring minds want to know. Unsolved Mystery #3: What happened to Willard E. Tenney? He just seems to disappear from all records. It seems clear from some of Lizzie’s letters to her cousin Eddie in Illinois that her mother was not widowed, but had left her father, whom she says she never remembers seeing (i.e. she was too young at the time of the divorce to retain any memory of him). Do you ever hear of any of my fathers people. Don’t you know, I just get to thinking of him. Sometimes knowing how terrible he felt, when mama left him for another. I don’t see how she could do it, for she told me he was just as good and kind to her as he could be. The other one [William John Clarke], was not, but it best not to talk of the past, when it is so unpleasant. But you have no idea how I feel when I think of poor old father. I never knew whether he died or was killed or what became of him. My how I would like to have had him with me in his old days. Lizzie never knew what happened to her father, nor do we. I find this very puzzling in light of all the records that are available to us now. He does not show up in census information, no death certificate, nothing on Find A Grave (a wonderful website for finding where people are buried). I haven’t given up, however. Still searching. 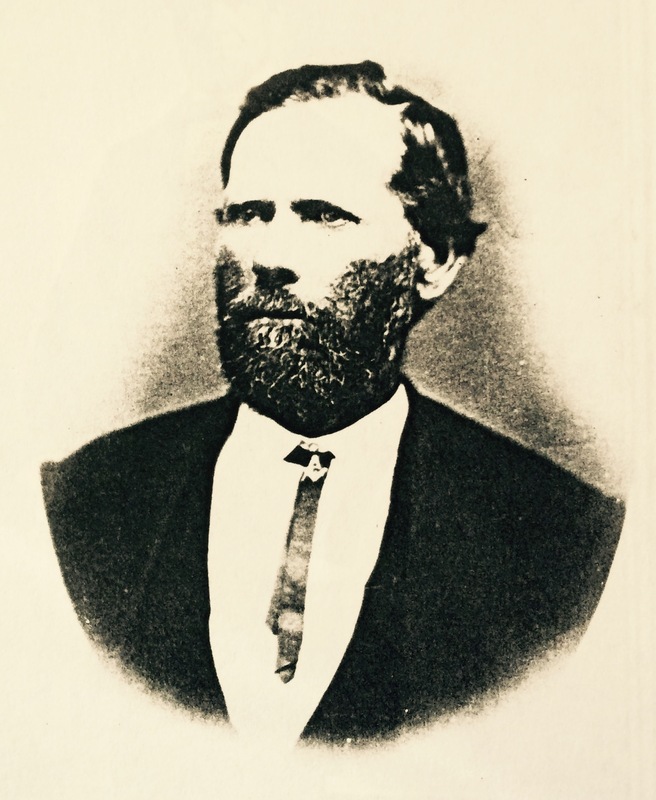 Our story ends today with William John Clarke and his bride, Catherine (Foster) Tenney Clarke settled on their ranch in Yolo County where they proceed to produce five more children in addition to Lizzie and Willie. Broadcasting from the Bernal Heights neighborhood of San Francisco, I'm publicly geeking out on my family history--bound as it is to the past 170 years (or so) of California history, and to points east before that. My ancestors came to California for the gold rush but stayed for the land. I've been uncovering many of their stories, and hope to make them as interesting to you as they are to me.